The Syrian city of Aleppo continues to celebrate its liberation from the terrorists. Western media describes terrifying scenes while reporting on the situation in the Syrian city of Aleppo. However, the actual situation on the ground is totally different. Sputnik Arabic met with some of the civilians. “The liberation of Aleppo means return to normal civilian life. People with their families will be able to live in security and stability once again,” lawyer from Aleppo, Safwan al-Kirzi told Sputnik Arabic in an interview. 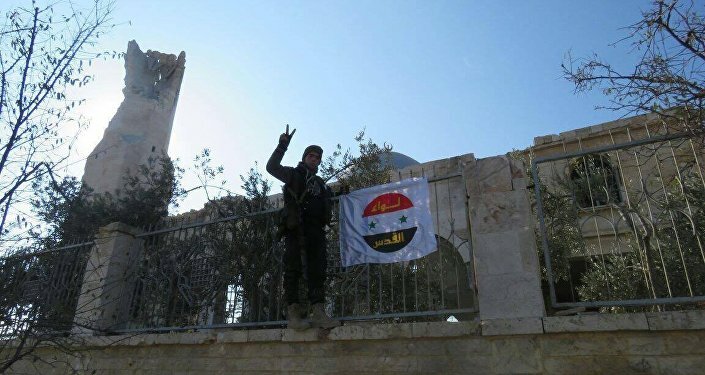 Hisam Tayar also had an emotional reaction to the newly liberated city. He said that, “Our hearts stopped with the beginning of occupation about five years ago. Now the pulse has reappeared and we hope that peace, tranquility and security will return to each home of our beloved Syria so that all people could live in a good neighborhood as it was earlier,” Tayar told Sputnik. He further said that when the city of Homs was liberated from the terrorists, hundreds of young people came to the city in order to help rebuild it. The Russian General Staff said earlier on Thursday that all districts previously controlled by militants in eastern Aleppo had freed, while the first convoy carrying over 1,000 evacuees had successfully left the area.